If you are in the market for a leather wrist- or shoulder strap for your camera you probably can’t see the Wood for Trees. There are a lot of brands that sell leather straps, and prices vary from a few Euro’s to several hundreds of Euro’s. Because of the large number of straps on the market it isn’t easy to find that one strap that offers value for money. Despite that I think I have found one. 4V Design is an Italian company that produces high quality Italian leather goods. They also make a number of leather shoulder- and wrist straps. The products are made in Trevisio, Italy. They use a genuine Tuscany made leather, Cuoio. Cuoio is different from other types of leather because the top layers of the skin aren’t used. This makes the leather more durable, and it isn’t as fast to crack. This means the products of 4V are more durable and will last for years on end. And of course, like with all leather products, they’ll only get prettier over time. Klik hier om de Nederlandse versie van deze review te lezen. 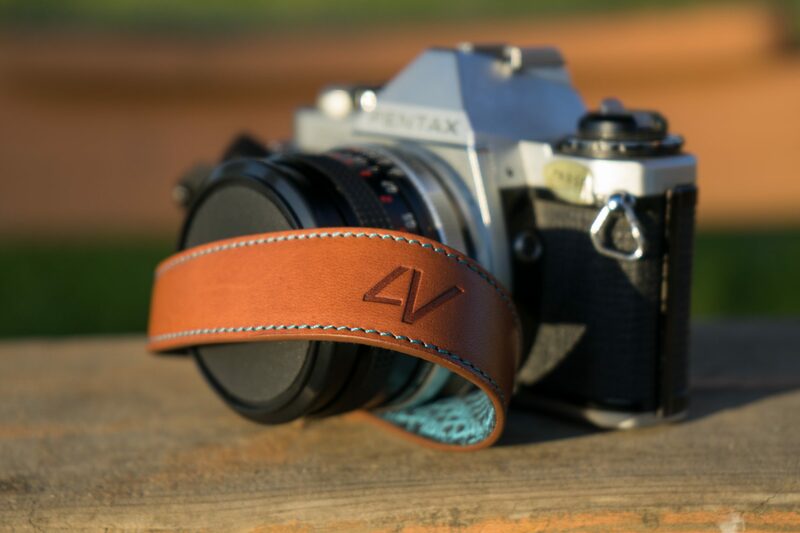 The strap I’ve reviewed is made of light brown leather with the , for 4V design specific, cyan coloured stitching. 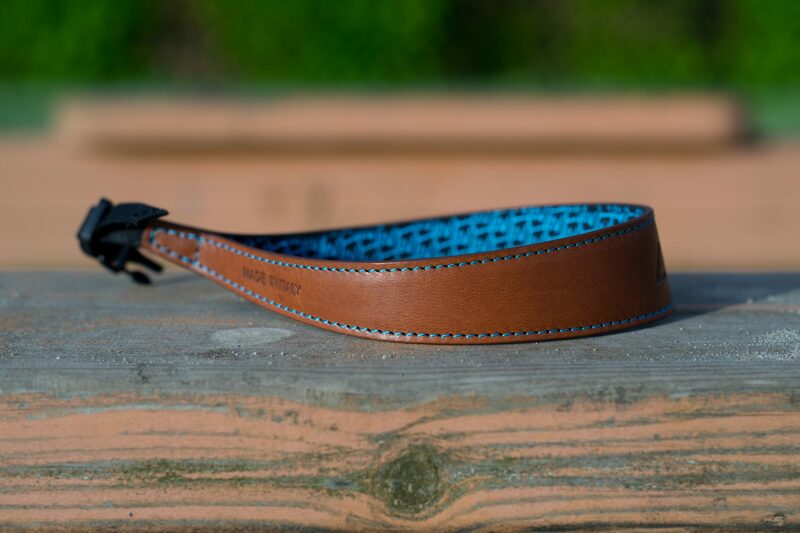 You can choose different colours of leather, and you can choose if you want the cyan stitching or want the stitching in the same colour as the leather is. In the Netherlands the Ergo Large wrist strap costs about 55 euro’s. 4V also has a smaller strap for lighter cameras, called the 4V Design Watch Medium Wrist Strap. That is a little cheaper at about 50 euro’s. 4V ships the strap in a nice looking little box with the strap wrapped in a piece of protective paper. Besides the strap there is a little bag of accessories to attach the strap to you camera. In the bag you’ll find two sizes of straps (a wide one with a quick connector and small one for lighter cameras), a metal ring and a small leather tab to prevent the metal ring from scratching your camera. It depends on the type of camera you have, which of the supplied accessories will work best for your situation. I’ve used the wider strap with the quick connector on my A7, so I can easily detach the strap if I want to use my camera on a tripod. The only downside to the wider strap is that it is a little long, but you can easily solve that problem by looping it through the connector twice. When you open the box there isn’t an doubt about the leather being real. The leather-smell is quite apparent. The other thing that stands out immediately is the quality of the finish. The stitching is made with a lot of attention to detail. The sides of the leather are also dyed, what is something you don’t see on cheaper straps. 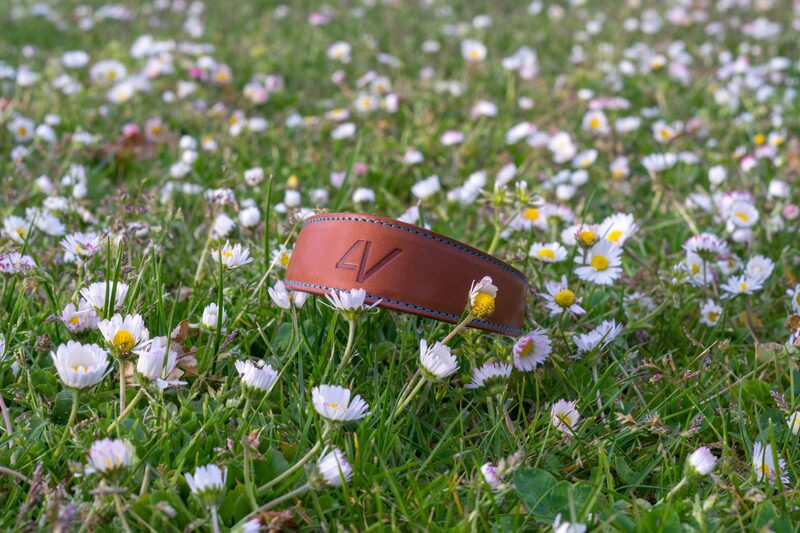 In the centre of the strap the 4V logo is embossed in the leather. The size of the logo is a little big for my taste. On the left side of the leather they have embossed the ‘made in Italy’ logo. That alone is enough for most brands to charge you double, but luckily 4V didn’t do that. The inside of the strap is lined with a soft and supple cloth material that feels a little like the material a wetsuit is made of. The material feels very comfortable and has just the right amount of grip. They have ‘pimped’ the black material with small cyan coloured 4V logos. 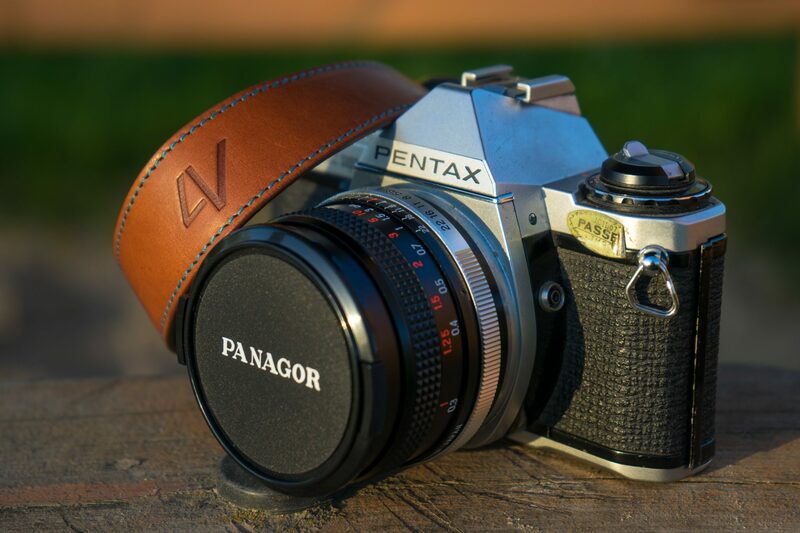 The leather of the strap has got an ergonomic shape (hence the Ergo name). It has a light curve that makes it fit your wrist comfortably. Because of the shape you almost don’t feel the strap when you have it around your wrist. The shape has got another advantage, because of it the camera will stay put on your wrist safely when you accidently happen to drop it. 4V has made a very nice, beautifully finished , Italian wrist strap for your camera with great value for money. 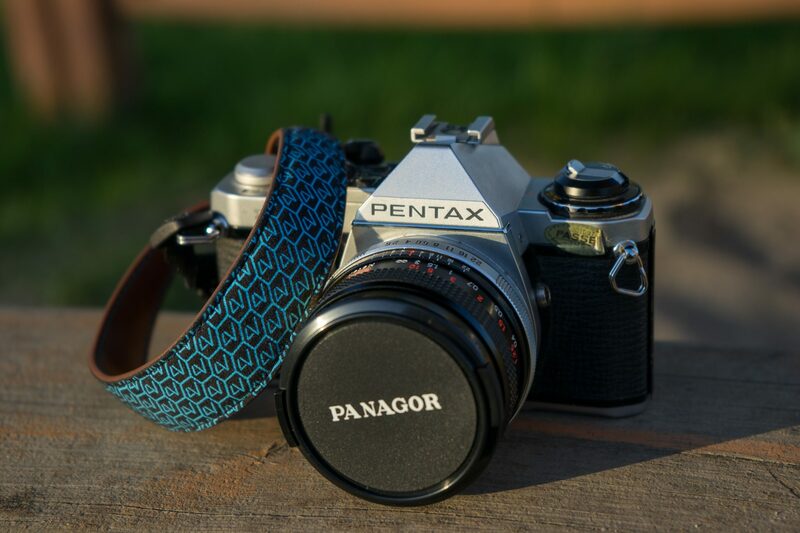 Besides the added comfort and safety this strap also is a stylish accessory for your camera. Especially when you choose one with the contrasting cyan stitching. I’d like to thank Foto Video Retail for supplying me with the strap for this review. Foto Video Retail is the Dutch importer for Benro, Tenba, Mefoto and several different brands of high quality photography accessories. For more information about Foto Video Retail, please check their website at: www.fotovideoretail.nl (Dutch site).